In a meeting convened on April 6, 2016, the Board of Directors of the Institute approved a Memorandum of Understanding (MOU) between the Institute and the Select Vestry of Christ Church. The MOU establishes the formalities for the institute to assist in the care and maintenance of the churchyard at Christ Church. We’re now past the planning stage – we’re officially up and running! The photo below was taken during the meeting which was held in the home of Bill Ruttledge. 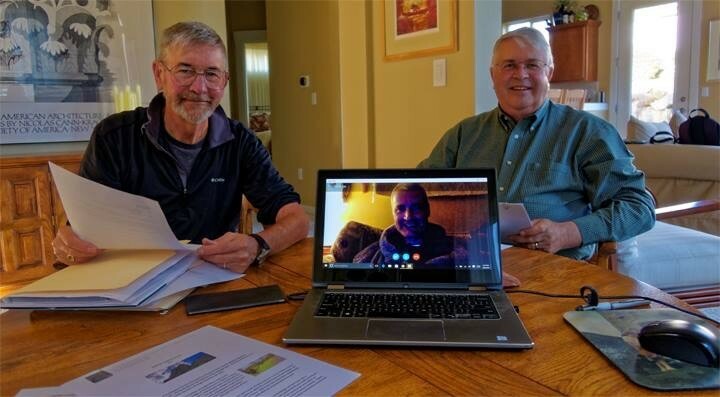 Pictured here – left to right – is Ed Ruttledge, Treasurer, Dr. Thomas Ruttledge, Secretary (who attended via a skype call), and Bill Ruttledge, President. In January 1991 a fund was established to raise monies for the care and maintenance of the graveyard at St Thomas’s Church, Moyard in the parish of Ballinakill. Known as the “Friends of St Thomas’s Graveyard ” is intended to care for the graveyard in perpetuity in the event that the little church should ever be closed. This had been a real and imminent threat at the time. 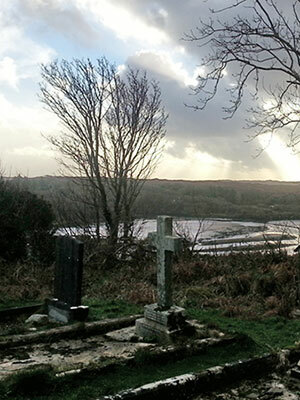 Many people remark on the charm of the surrounding graveyard, which is a notably sunny spot set upon a hill and a place of deep peace and serenity. It is very important to know that, whatever the future might bring, the graveyard will be kept in very good condition in respect of those who went before us and whose lives made a significant difference to this.